Neoporteria polyraphis (Pfeiff. ex Salm-Dyck) Backeb. Accepted Scientific Name: Eriosyce villosa (Monv.) Katt. Altitude: It grows at elevations of 0 to 800 m asl. Habitat and Ecology: Eriosyce villosa occurs in coastal hills (lomas costeras) on rocky soils together with Neochilenia napina. It is frequent and the population stable. The major threats are illegal collection and industrialization to process steel. Bridgesia polyraphis (Pfeiff. ex Salm-Dyck) Backeb. Neoporteria villosa var. laniceps (F.Ritter) A.E.Hoffm. Description: Eriosyce villosa var. polyraphis much better known under its old name, Neoporteria polyraphis, is now considered nothing else than Eriosyce villosa, but the plants in cultivation are not exactly the same, the spines are a little shorter and the flowers are a bit more pointed. 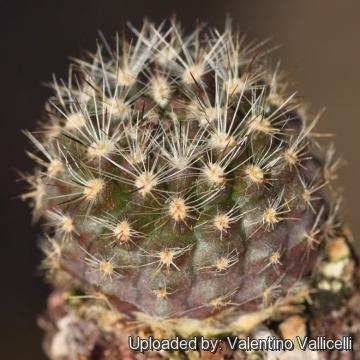 Note: The number of spines (especially the bristly or hairy radials) in Eriosyce villosa shows a certain degree of variability depending on origin. The otherwise similar features of “var. villosa” and “var. polyraphis”, namely size and form of stems, flowers, fruit, etc., prove, that is impossible to differentiate between these taxa. Habit: It is a small solitary cactus densely folded by bristly spines. Stem: Subglobose to Globose becoming elongated, green or very dark green (almost black) or dark red, up to 15 cm tall, 8 cm in diameter. Ribs: 13-15 Deeply notched between areoles. Spines: ± dense, long, glassy gold-brownish to black central spines with thin bristle like grey radials. Flowers: Bright magenta, borne on young areoles, 2-2,5 cm in diameter, Pericarpels and floral tubes with long wool and gassy white bristles. Blooming time: Blooms early in the year. Occasionally forms some buds late in the previous year, and it can sometimes flower during the winter, although the main burst of flowering is in April. Fruits: Elongate, red, dehiscing by basal pores. Eriosyce villosa (Monv.) Katt. 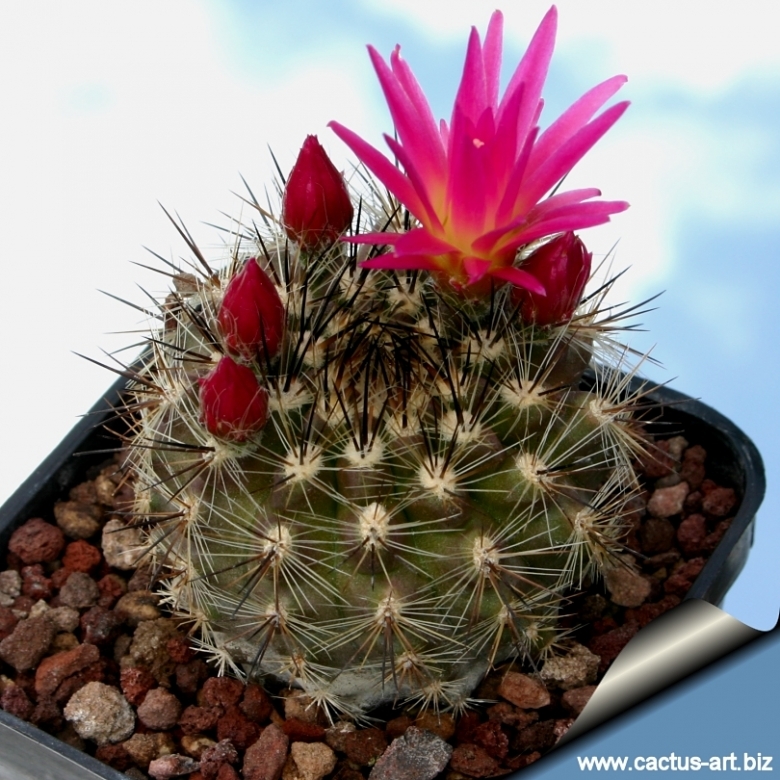 : Small solitary cactus dense, long, glassy gold-brownish to black central spines with thin bristle like grey radials, the number of spines (especially the bristly radials) is quite variable. Neoporteria polyraphis (Pfeiff. ex Salm-Dyck) Backeb. : This plant is now considered nothing else than Eriosyce villosa, but the plants in cultivation are not exactly the same, the spines are a little shorter and the flowers are a bit more pointed. Neoporteria villosa var. laniceps (F.Ritter) A.E.Hoffm. : has brownish-green body with long thin straw-coloured to brown spines producing a bird's nest effect. The inner petals remain upright around the style. Distribution: Carrizal Bajo, 03 Atacama, Chile. 1) Faundez, L., Guerrero, P., Saldivia, P. & Walter, H.E. 2013. Eriosyce villosa. In: IUCN 2013. “IUCN Red List of Threatened Species.” Version 2013.2. <www.iucnredlist.org>. Downloaded on 16 January 2014. Cultivation and Propagation: It is a summer grower species. Easy to cultivate but somewhat rot prone if kept in a non ventilated place. Requires a very fast draining drying soil. Water regularly in summer, but do not overwater. Needs a full sun exposure (or light shade) Good heat tolerance. Hardy to at down to -5°C for brief periods.